The Free Clinics are operated in partnership with students from two of New York’s premiere medical schools: New York University and Albert Einstein College of Medicine. Students are supervised at all times by senior Institute physicians. Free clinic services are only for adults. All children in New York State are eligible for Child Health Plus health insurance. You can make an appointment at any of our locations and we will help your child enroll in Child Health Plus. After two visits to a free clinic, we will begin to make appointments for you at our regular health center. 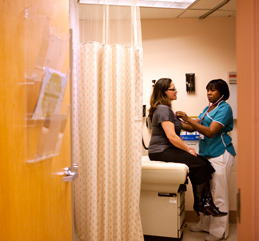 Institute for Family Health centers accept all patients, even those without insurance. We offer discounted services based on your family income. You will not be turned away. Saturday mornings, 9am-12pm (except holidays). Some walk-ins are accepted, but it is best to call and make an appointment to guarantee that you will be seen. Visit the Walton-Echo Free Clinic website for more information. Saturday mornings, 9am-1pm (except holidays). An appointment is necessary. Call 212-206-5200 to make an appointment. Visit the New York City Free Clinic website for more information. The Women’s Health Free Clinic (WHFC) became the nation’s first comprehensive, free, student-coordinated women’s health clinic. The clinic is a partnership between New York University School of Medicine, the Reproductive Health Access Project, and the Institute for Family Health. The Women’s Health Free Clinic is opened two Saturdays per month; please call for a schedule. The Free Clinic at the Sidney Hillman/Phillips Family Practice helps uninsured patients access health care. We can help you get health insurance. Click the image for more info.